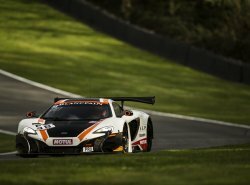 On another action-packed weekend for McLaren GT customer teams around the world, Factory Driver Rob Bell took the overall lead in the Blancpain GT Series Drivers Championship after finishing P4 in the Sprint Cup Main Race at Brands Hatch. At the wheel of the #58 McLaren 650S GT3 for customer team Garage 59, and paired with fellow McLaren GT Factory Driver Alvaro Parente, Bell continued his impressive start to the 2016 Blancpain GT Series season which has seen him take a win and finish in the top ten in the other three races so far. The 650S GT3 also had a successful weekend racing at Barbagallo Raceway, Western Australia in the CAMS Australian GT Championship with a double podium result. 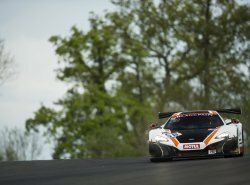 In total, McLaren 650S GT3s scored six top-five finishes across the two series. 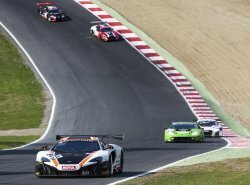 The famous Brands Hatch circuit played host to the second round of the 2016 Blancpain GT Series Sprint Cup, and McLaren GT Factory Drivers Rob Bell and Alvaro Parente finished P8 and P4 in the Qualifying and Main Races respectively. Initially the duo qualified the #58 650S GT3, prepared by customer team Garage 59, in P6 and slipped back to P8 in what turned out to be a frantic Qualifying Race for the majority of the 37-car GT3 field on the narrow Kent-based circuit. In the Main Race the pair climbed the standings, Parente in P5 before a late safety car. When racing resumed with less than 10 minutes remaining Parente grabbed P4 and pushed hard for a podium slot in the closing laps. 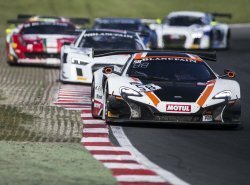 After scoring 12 points on Sunday, McLaren GT Factory Driver Rob Bell now leads the overall Blancpain GT Series Drivers Championship. It was a challenging weekend for the #59 Garage 59 650S GT3 however. McLaren GT Factory Driver Côme Ledogar in his Sprint Cup, and Brands Hatch GP debut finished P32 and P25 in the two races with teammate Martin Plowman. Meanwhile, in what was the first trip in Australian GT series history to Barbagallo, the #60 and #61 Tekno Autosports-run customer 650S GT3s were most successful. In Race 1 on Saturday, the #60 Nathan Morcom Tekno Autosports DPO 650S GT3 which started the race P14, finished the race P2 after a late charge on the drying circuit. Further down the order, the #37 Klark Quinn 650S GT3 run by customer team Darrell Lea finished fourth in the mad dash to the finish after a safety car period prompted a late restart with 12 minutes to run in the hour-long race. The 650S GT3 then achieved similar results in Sunday’s Race 2. A McLaren was on the podium once again, but this time it was the #61 Beechwood / SLR / Buildmap car, also run by Tekno co-driven by Elliot Barbour and Nathan Antunes. The duo started P8, and like the #60 the day before, fought through the field to finish P2 and on the podium. The race also had its green flag running shortened, this time by a sizeable incident on the first lap of the race, which brought out a lengthy safety car period while marshals cleaned up the debris and repaired barriers. Klark Quinn – who now leads the championship following the event – was on course for another podium after crossing the line P2, but the officials had to add on compulsory times for the pit stops that the teams were forced to skip during the time under safety car conditions, which saw him and his #37 McLaren 650S GT3 drop to P4; promoting Antunes and Barbour to P2. McLaren GT customer teams also finished in P5 and P6 in the race, reinforcing a strong weekend. The #59 650S GT3 of Jonathon Webb and Matthew Kingsley rounded out the top five, just ahead of Morcom’s Tekno DPO machine which finished high up the order once again.